The centenary of John Cage’s birth last year prompted widespread celebration of his life and work, with a mass of performances, events, recordings and publications. Among this activity two releases stood out: EM Records’ John Cage Shock LPs, collecting performances from Cage’ massively influential, for all concerned, 1961 tour to Japan; and Kay Larsson’s Where the Heart Beats, examining the seminal early stages of Cage’s development alongside his interest in Zen Buddhism. The lead up to 2012 was hardly quiet in Cage world either, with Kenneth Silverman’s exhaustive, and exhausting, biography Begin Again published in 2010, New World Records’s acclaimed Music For Merce box set also released that year. Subsequently New World’s The Art of David Tudor collection came out this year, featuring many works by Cage and others strongly under his influence, while Mode Records’s Cage Edition keeps going, volume 49’s The Piano Works 9: First Recordings released last month. While this sort of centennial activity is not unusual, Cage has certainly inspired more than most, and it hasn’t slowed down. Admirers and detractors alike would agree that there is more (or less) to Cage than most artists. He was prolific in all his endeavors, which stretched to poetry, criticism, philosophy, painting, sculpture and performance (not to mention mushroom picking, gardening, rock collectingâ€¦), yet his appeal is not down to the breadth of his work; nor quite to its nature, whatever the medium. His ability to make everything he touched somehow Cageian does get us close, to the way in which his philosophy was embodied, indeed enacted, in all that he did. His work becomes a wholesale introduction to a radical approach to art and life (and with Cage the two are very much intertwined). Cage’s Zen influenced work did not explore, analyse or promote Zen ideas, but did it. 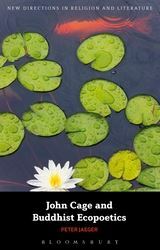 Peter Jaeger’s book John Cage and Buddhist Ecopoetics explores this acting out of Zen principles, contrasting Cage’s work (specifically his writing) with that of contemporaneous Buddhist poets, and celebrating Cage’ complete immersion in Zen through his work as a radical challenge to Western values. Consequently there is little discussion of Cage’ music, for that look to Larsson and Silverman, and to the recordings themselves (Cage’ music is never really about music anyway), but Jaeger offers a more vital reading of Cage’ enduring power, with particular urgency for these weary late capitalist times. Jaeger’ Cage is an idealist, so of course there is much that is unexplored here. Delving deep into Cage’ music is thrilling, and there is still much to there to analyse. Reading Cage’ writing remains a particular pleasure, and his texts are all readily available. For Cage the man, his life, and Buddhism Larsson’ Where the Heart Lies offers the most engaging introduction, and it is worth looking far and wide for his dalliances with other movements and thinkers, from Dada to electronics, and from Duchamp to Joyce. Flesh and blood details are not to be found here. Once you’ve digested all that however, it is time to take on Jaeger’ argument, and attempt to introduce Cage’ visions to your own world.